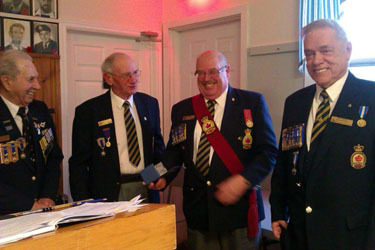 Peninsula Branch 62 Legion honours members and residents. Peninsula Branch 62 held their 3rd annual honours and awards dinner on Saturday February 27th which featured guest speaker comedian Jeff Irwin. Following an afternoon of socializing and musical entertainment a roast pork dinner was served by the local 140 Peninsula Army Cadets and 268 Bras d'Or Sea Cadets from Quispamsis. Honours and Awards Committee Chairmen, RCMP Staff Sgt (Ret.) Steve Gourdeau and Past Branch President Bill Wood, presented a number of members with years of service pins along with Certificates of Appreciation and Certificates of Merit to members who provided extra support to the Branch during the past year. Certificates of Merit were presented to residents of the local community for meritorious services they have provided to the Legion over the past year. Ladies Auxiliary President Barb Pitt, assisted by Beth Quigley presented years of service pins to Dot Phillips, Grace Smith, Jean MacDonald, Sherry McKay, Theresa Jones and Joyce Newstead. Steve Gourdeau was assisted by Branch President Joe Stack with the presentation of a Royal Canadian Legion Friendship Award, at the National Level, to local resident Maria Wiggins for her extraordinary support to the Legion and the Community as a whole. While much of what Maria does to help in the community is quiet and behind the scenes we heard some of what she does to positively affect others. Certificates of Merit were also presented to Branch Canada Day Committee workers, Barb Pitt, Kelly Newstead, Kathy Campbell, Mae and Bill White, Bill Wood, Sherry McKay and Jim Haslett for their consistent dedication for this very successful community event. Certificates of Appreciation, for a variety of ongoing volunteer activity with the Legion for various events some of which include Branch cleanup, donated items, help with Canada day etc. were presented to Pastor Chad Flector, Bonnie Jenkins, Jo Burke, Nelson Trecartin, Calvin Gilliland, Bobbie Pitt, Wendy Driscoll, Kris Halpin, Bob Laver, Greg Boudreau, Joel McPherson, Angie Pitt Locke and Herb Jones. The Legion "Service Medal" presentation was assisted by Royal District Commander Terry Campbell to five members for continuous contribution to the Branch well above and behind the scenes over several years. Bill Wood, Cheryl Donnelly, Barb Pit, Jim Haslett and Kathy Campbell were recognized for their commitment to the Legion activities above and beyond what is expected of a member or their elected/appointed position. The final presentation of the day was for the Annual Legionnaire of the year award presented to Terry Campbell for all his tireless efforts provided to the branch over the past year. Terry assists at the brunches, Canada Day and Remembrance Events, helps prepare food, set up and clean up for various branch functions including the formal Mess Dinner for 140 Peninsula RCACC. Terry activated the Branch Commemorative Memorial Book and was significant recruiter for advertising donations from the public, Branch and Ladies Auxiliary members for kitchen refresh fund. Terry also promotes Peninsula Branch 62 by being one of the branch volunteer servers at the farmers market. Legionnaire of the year Terry Campbell being congratulated by (From the left), Branch 62 Honourary President Lloyd Saulnier, Branch 62 President Joe Stack, Terry Campbell and a Past President/Honours and Awards Co-Chair Bill Wood.